Giorgi seems bored with his job. He tells us about his children, flips through pictures on his phone, showing us one daughter, then the other, at school, at home, in the park… He glances at the road occasionally, but seems disappointed to find it still there, still a highway, going straight ahead. Giorgi seems bored with his job. He tells us about his children, flips through pictures on his phone, showing us one daughter, then the other, at school, at home, in the park… He glances at the road occasionally, but seems disappointed to find it still there, still a highway, going straight ahead. He puts his hand on the wheel sometimes, but only when absolutely necessary. Mostly he just nudges the truck straight with his knees. My hands grip the edge of the seat, my knuckles whitening. I smile at the next picture – “Oachin krasivaya!” – how beautiful! – I exclaim again in my crappy Russian, gripping my seat still tighter. I had the last of the Georgian wine for breakfast and it’s making me woozy. Giorgi deposits us in Khashuri, shaky though intact, and steers his truck in the direction of Poti on the Black Sea coast. We’re going the other way, towards a small border crossing in the mountains. Khashuri is a tiny town. Everyone stares at the two crazy foreigners and their enormous backpacks. Hrach is also pulling his guitar and amp in a small trolley, which adds to the spectacle. We find a small café and order coffee. “Where are you from?” the woman asks me in Russian. “Ya iz Angliski” I tell her. I buy my last khachapuri from an unusually smiley woman in a kiosk. Smiling is generally frowned upon in post-Soviet countries, unless you already know the person you’re smiling at and have a genuine reason for doing so. This woman smiles at me for no reason, which warms my heart. I enjoy my khachapuri immensely. It’s a stodgy little pastry filled with gooey melted cheese, and I’m completely addicted to them. Two things you’ll probably notice if travelling in Georgia, are that half of the men in the country are named Giorgi, and that it has the best food in the entire world. It’s also extremely affordable. A loaf of delicious Georgian bread, for example, will set you back all of 60 tetri – that’s about $0.30c. 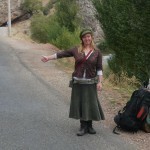 An older man stops for us on his way to Akhaltsikhe. 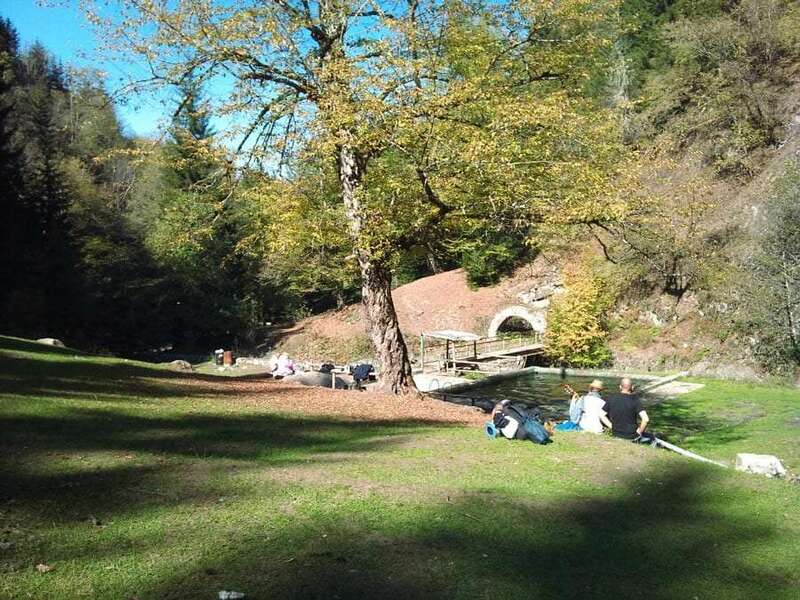 We get out at Borjomi, though he’s going further on our way. It’s getting dark already, and I know a great camping spot. We cross the bridge from the highway into the centre, following the route I remember from two years ago. The park seems closed, but one gate is ajar. 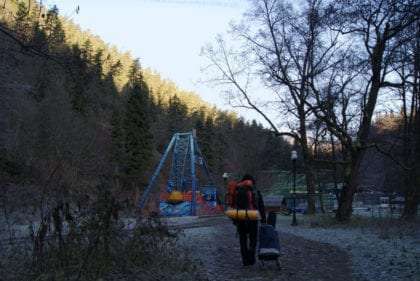 The concrete path ends abruptly after the last fairground ride and we plunge into the darkness of Borjomi National Park, now following a dirt track that winds through the gorge alongside the river. I’m looking for a bridge I remember, a wobbly shaky bridge. It’s dark now, and our packs are heavy. I leave Hrach by a bench with the bags. 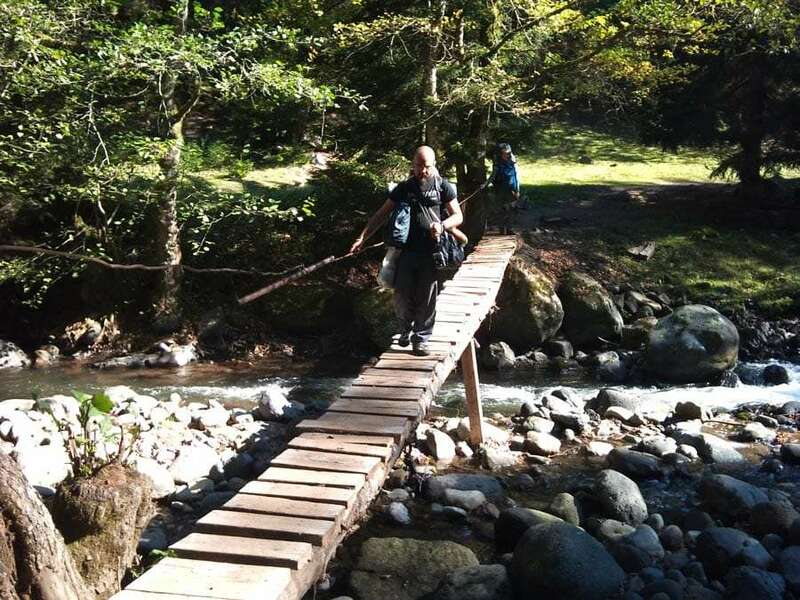 I walk and walk, but the shaky bridge is nowhere to be seen. I trudge back to Hrach by the light of my phone and we pitch the tent by the benches instead, a little disappointed. This bridge appears to have vanished. 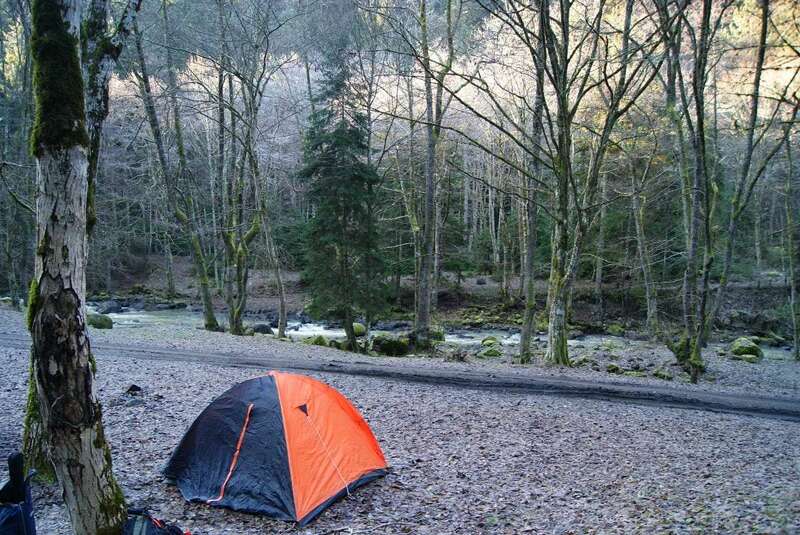 Sadly, we cannot find this wild camping paradise. It’s a cold night. I’m wearing all of my clothes and our sleeping bags are zipped together for the extra warmth of our bodies. I have the top part of my sleeping-bag folded down over my face, keeping warm mostly by my own breath. Hrach, feeling claustrophobic, keeps opening a little hole where the cold air seeps through. In the morning, we understand how cold it really was. Omelettes and coffee in a warm restaurant on the way back through town put us back together again. We’re not by the road long when a marshrutka trundles past. Marshrutka is the Russian name for the small shared minibuses used throughout the South-Caucasus. They’re usually very cheap. I squint at the Georgian letters on the front: ახალციხე – Akhaltsikhe, the last town before the border! I flap my arm by my side without really thinking about it, and the minibus swerves into the lay-by behind us. “How much?” I ask, in what I hope are the correct Russian words. It’s four lari each – about $2. I look at Hrach, who shrugs. We climb on board amidst penetrating stares from elderly locals, and settle in for a bumpy ride. “Where are you from?” People shout at us in Russian, again and again as we plod through Akhaltsikhe. An older Giorgi in a truck takes us two kilometres to where the road splits by an old bus stop and a train junction. A man comes out of his little guard box to stare at us. He watches us standing with our thumbs aloft until the spectacle grows tiring, then returns to his box, bewildered. Eventually a car stops. The driver is a polite, softly-spoken man, with surprisingly good English. He nods when I tell him we’re going to the border. “Yes, I can take you there.” We climb in. To make conversation, I ask if he works on the border. “No. Actually…” he says, faltering, “I am just taking you there. I live in the village we just passed.” This lovely man, whose name, for once, is not Giorgi, tells us that he plans to go to England to work. He’s from a tiny village not quite on the border, and has learned English by himself. He drops us at the gate to Turkey and I give him my email address. I want very much to return some of the kindness this man has shown us. It’s a beautiful end to our time in Georgia.